This weekend, Patrick and I decided comfort food would be a nice way to spend Sunday evening – especially after I left him alone all weekend while I attended Brittany’s bachelorette party. We went for meatloaf and mashed potatoes. 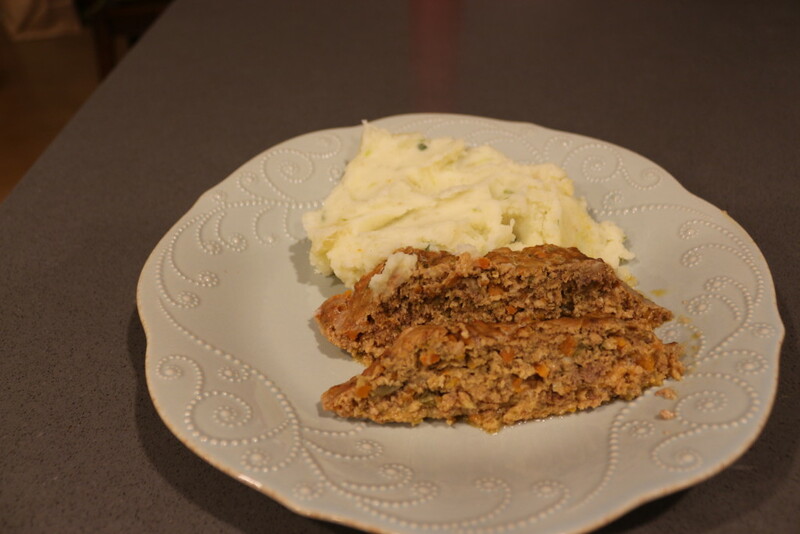 The recipe for the meatloaf is one my grandma had copied from a magazine years ago – Patrick and I actually first made it together on one of our first Christmases as a couple (after a 15 mile bike / rollerblade ride – good times). This is the first time we didn’t make it with all turkey (and we made it a little larger than last time to have more leftovers), but no matter how we make it, it always tastes delicious. 1. Prepare the veggies by chopping them up by hand by using a food processor. Heat the olive oil in a pan, and saute the veggies so they release some liquid, for about ten minutes. Allow to cool while you prepare the other ingredients. 3. In a large mixing bowl, beat together the eggs, half and half, ketchup and spices. 4. Add the meat to the half & half mixture. Then add the bread crumbs and the cooked veggies (without the liquid). Knead the mixture together for about 5 minutes with your hands. 5. On a cookie sheet lined with foil (and sprayed with nonstick cooking spray), form the meat into a large, loaf-like shape (or you can break it into two loaves). 6. Bake in the oven, covered with foil, for about 1 hour, or until the meat is fully cooked. Eat with salad, mashed potatoes, on a sandwich, or as is. This entry was posted in Mains and tagged BEEF, Carrots, turkey. Bookmark the permalink.